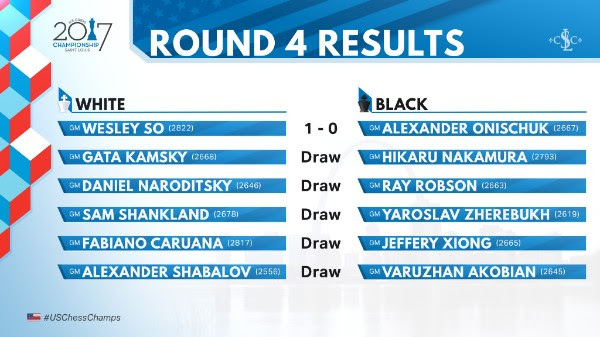 So vs Onischuk was a clear example of why Wesley is considered by the vast majority of the chess world to be the biggest threat to Carlsen’s dominance. Just like in his game against Shabalov, Wesley decided to take his opponent out of popular theory early on and played the KIA (King’s Indian Attack). While the opening was not very ambitious, the ensuing middle game normally favors the better player. This is exactly what Wesley wanted and how the script played out. Onischuk equalized with ease, but was soon forced to find his way through the middle game maze, something that he found difficult to do. He managed to keep the game balanced early on, but when Wesley decided to break the repetition with 26.h3! 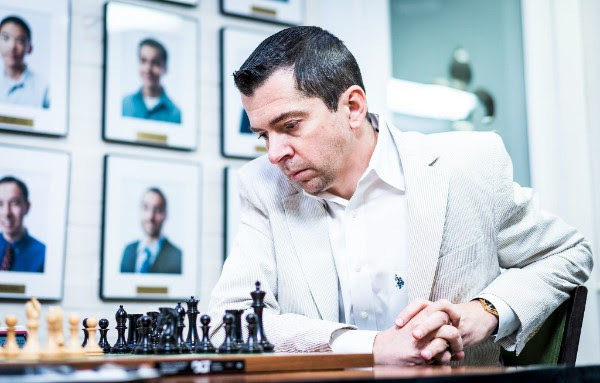 ?, Onischuk was caught off guard and soon started playing imprecise moves that quickly lead to a lost ending. Wesley kept his cool, like he usually does, and ended the game with precision. 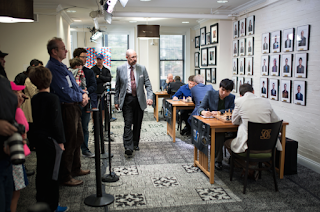 Caruana vs Xiong was a highly important matchup to follow. Fabiano surely came into this game with a great deal of enthusiasm and high hopes. He was playing white vs the youngest participant and with a win he could have caught Wesley at the top of the table. His preparation in the anti-Berlin was top notch as he quickly got a better endgame. 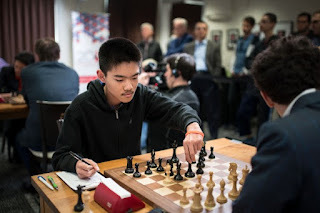 But Xiong was almost implacable, and he played a flawless defensive game all the way up to move 29 when he made an inaccuracy that could have costed him dearly. Fortunately for Xiong, Fabiano didn’t find the best moves and the game soon entered a path of equality. 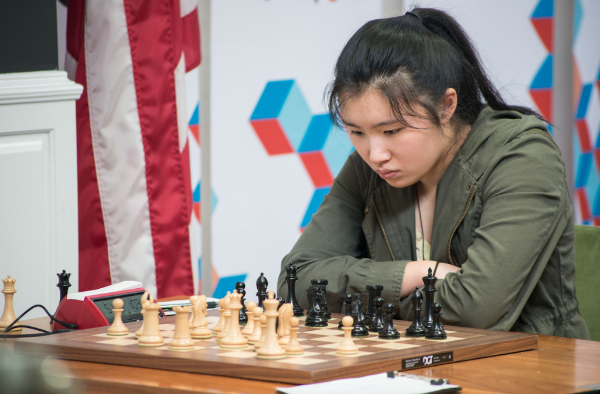 Slowly but surely, Yu began outplaying her more experienced opponent and ended up in a completely winning position, and that’s when the real drama started. 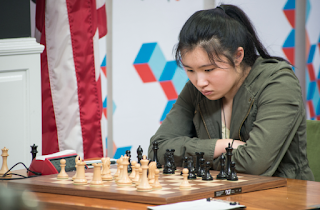 Showing an incredible lack of experience, Yu allowed her opponent to repeat the position three times, but to everybody’s disbelief Krush decided not to claim the threefold repetition. Yu immediately changed the course of the game and soon won the endgame. 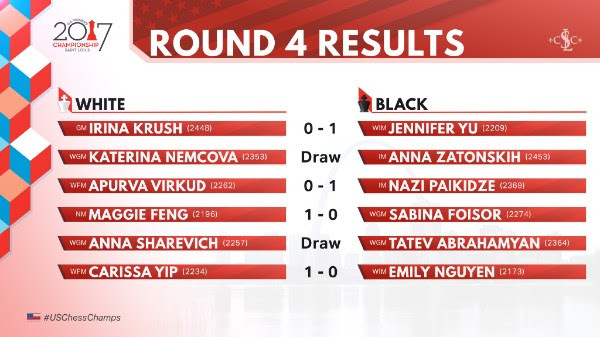 A disappointing results for Irina and a great moral booster for the young Yu!